I'm coming to you today with a sweet little freebie inspired by my 9th grade gym teacher. He had a chalkboard with the saying "Put Ups Only". That little quote has stuck with me forever and ever! It really irks me when my school kids and my home kids use unkind words. inspirational quotes are all the rage these days. So I jumped on the train with a one way ticket to Positiveville! 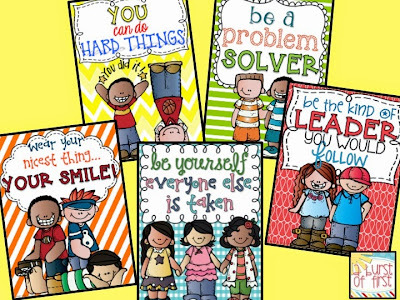 I hope these visual reminders help your students (and mine) to be positive and kind people!! Head on over to my tpt shop to grab them. Your feedback would be much appreciated as well!